Raaga.com: Salman Khan yet again in legal tangle! Producer sues Rs 250 crore defamation case! Salman Khan yet again in legal tangle! Producer sues Rs 250 crore defamation case! Salman Khan and controversy go hand in hand. The DABANGG star may have had some relief in the 2002 hit-and-run case and may be awaiting the outcome in the black-buck trial but even while the two cases finish; the actor is yet again in legal trouble. 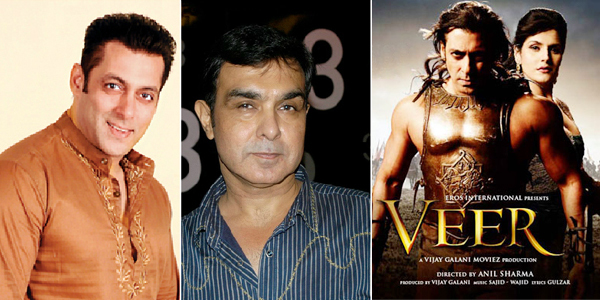 This time he has been dragged by film producer Vijay Galani, who made the major debacle VEER with him in the lead. According to reports producer Vijay Galani has sued Salman Khan for Rs 250 crores as the honorable court has given verdict in his favor in the long legal battle against Salman Khan over monetary matter. The honorable court in its decision found Salman's claims to be baseless and the court gave judgment in Galani's favour. Now Galani has sued Salman for defamation. "I cannot tell you what I've gone through during the last three years. My mental agony and the money on lawyers have left me drained. I've filed a Rs 250 crore defamation case against Salman for mental agony, harassment, loss of face. Who will give me back the 3 years that I've lost?"